I know this isn't breaking news to anyone who has conservative values, but the liberals are at it again with choosing their politically correct topic of the month - the Washington Redskins. This name controversy has been going on for years, but after the apparent victory of the Democratic party last week in Congress, they are trying to spike the football (pun intended) and are bringing up the topic again. I've been a football fan for many years. Not once did I garner images of hate and disdain when I would hear the Redskins name mentioned or see their logo on a helmet. But that's what the liberals want you to think by this ridiculous comparison. That the team continuing to use their name and logo is comparable to horrendous acts of hatred, discrimination, and cruelty. And furthermore, why this team's name and logo? Because it's easy and simple to use as a political cause because when conservatives have a response like the one I am having right now, it can be called racism. So the New Jersey Devils name is ok to use because it may only offend Christians? The Buffalo Sabres and Cleveland Cavaliers names and logos are ok because guns are the issue, but other weapons are fine? The Oakland Raiders, Pittsburgh Pirates, and Tampa Bay Buccaneers are ok because pirates are fun characters in Disney movies, not criminals who partake in robbery and violence on the open seas? 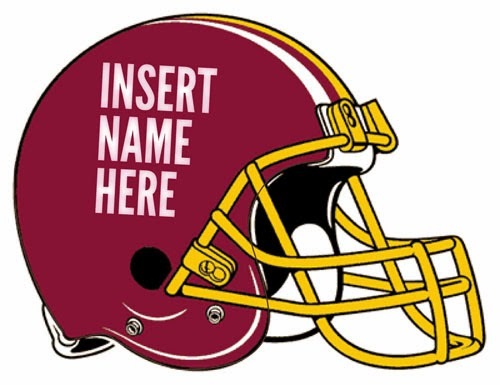 A team's name and logo does not cause derogatory or negative feelings unless you point them out, which the liberals are doing with the Redskins. If we let them win their political correct fight this month, what will be next month's fight: We are banned from using the term "manhole cover" because it is discriminatory to woman? I say we ban Mario and Luigi from Nintendo too. I'm offended!